A friend has published a memoir of his late father. When my own father passed away I wrote a memoir and published it. The entire process was rewarding: I had honoured my father, I had told his story ‘that a later generation might know’. And I had managed my grief. My friend Michael Komesaroff has achieved all those things with his memoir, “What the Eye Will See”. What stands out in the personality of Willie Komesaroff (the author’s father) is his jealous protection of his good name, his deep to the bone integrity. In addition to this private story the author has brought to bear the meticulous research skills that he employs as a visiting professor, consultant and journalist in his professional field, which is Asian mineral investment. The result is a small book with a big story. 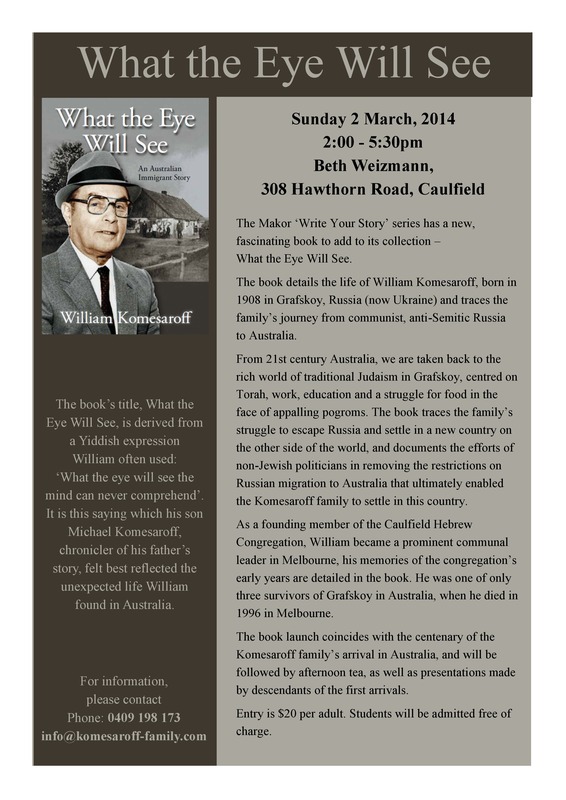 It is a very Australian story – the story of the Komesaroffs, a Jewish clan from the Ukraine; of their immigration to Australia during the years of the Russian Revolution at a time when Australian government policy expressly excluded migrants from that area. How government policy was waived and how the Komesaroffs responded in the host country are the stuff of unseen greatness. This country’s gentile politicians who overcame public prejudice and government policy; the Moses figure of the Komesaroff clan who plucked his family from peril and set them up here; the manner in which that clan buckled down, worked hard, prospered, multiplied and rewarded Australia; this is the story of Australian migration success, writ large – but written as it were – in invisible ink. Such is the characteristic modesty and self-effacement of the Komesaroffs (noisy scion Michael conspicuously excepted) that although the clan is Melbourne’s biggest Jewish family and its members are giants of professions, they stay away from limelight. 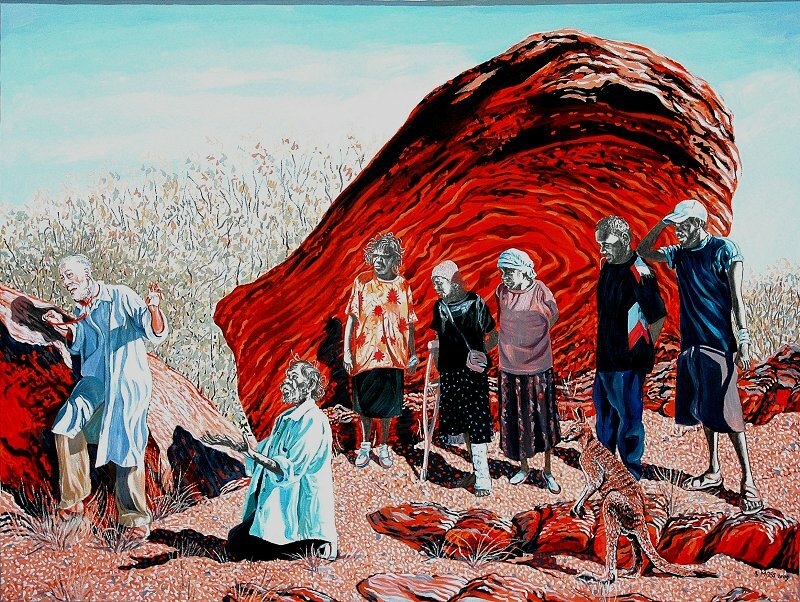 “What the Eye Will See” allows us all to see and appreciate elements of the greatness of this country and the hidden greatness of some of its quieter achievers. Michael invites my readers to the launch of the book. It will be a good afternoon. Apparently Mother’s Day is neither a public holiday nor a religious holy day. Anyone who is not a believer is nevertheless a moral outcast. Even Al Capone loved his mum, one day of the year. Mother’s Day is not ancient, rather it is the brainchild of a marketing opportunist at a greetings card company. The same is true of Father’s Day. There is a problem with both Days: where to place the apostrophe. Is it the day of the one and only mother you happen to be celebrating? If so, it is Mother’s Day. But if all mothers, from the Madonna onwards, are celebrated, it becomes Mothers’ Day. But as mothers become more numerous, sentiment is diluted. Unless you are a politician gift wrapping pre-election pork for the barrel, you can’t get teary over every mother in the cosmos. What should make us tearful is the abuse of the apostrophe. In the fruit shop – Lovely Navel’s; in the supermarket – New Seasons Spud’s; at the pharmacy – Retread your Old Condom’s Here. There is news of a sighting. More precisely, there’s a report that someone in Bristol claims a sighting. It might even be true – perhaps the someone did sight the sun in Bristol, briefly, the day before yesterday. The day before I arrived. No-one in Bristol should shed nature’s protective fur. For that matter, no-one anywhere in Britain ought to follow that advice. Gippsland Lakes, Victoria, Australia, March, 1990. A lady, middle-aged, bellows across the water from the deck of her rented yacht. She projects her fruity English accents in the direction of Dad’s boat. My aged uncle sits on Dad’s deck, enjoying the day’s end. The early evening has turned decidedly cool. Dad and his crew shelter below decks, while Uncle sits above, nodding pleasantly from time to time in the English lady’s direction. As dusk descends, Uncle, who is deaf, drinks in the peace. The English lady and Uncle have not been introduced. The lady is pleased to share her life story with Uncle. She tells him about her travels and her maritime experiences. Visiting the daughter, actually. Lives here in Orstraliah. Married here, what? Always enjoyed boating, all of us. Cowes Regatta, what not. Husband’s vice commodore there. Cool evening. Reminds one of a coolish time at Cowes. Husband and I went for a quiet evening sail. Left the club, tooled around till dark, turned for home. Monster squall blew up. Caught us unawares – below decks taking cocktails. As one might – moon above the yardarm, what? Uncle – watching a pelican gracefully spilling air, gliding, teasing his sight in slow, elegant inevitability – misses his cue, fails to nod. His locutor raises her voice helpfully. Nasty Squall. Tipped the bally boat over. Husband and I took to the dinghy. Squall passed. Squalls do. Boat out of sight, had to row to land. Uncle, enjoying the first stars behind the lady, looks attentive. From time to time, as her jaws come to rest, Uncle obliges with another nod.